The motion picture industry has long enjoyed a love affair with trains. In the industry’s infancy, rail travel was as common as plane travel is today, and railroads were an integral part of the industrial landscape. The earliest motion picture films were scientific novelties and popular entertainment that captured moving images and reproduced them for the first time for the entertainment of the public. The first moving picture exhibitor opened a storefront “theatre” around 1895 in New York City. This small beginning quickly spawned a host of others, and the era of the nickelodeon was born, but their product was limited to short films with no story line. In 1903, however, pioneer film maker Edwin S. Porter of the Thomas Edison Company made a\ film with a real plot that featured America’s first movie star, “Bronco” Billy Anderson, a train and a robbery. Though only 10 minutes in length, “The Great Train Robbery” revolutionized film making. Before long, “photoplays” of several reels’ length were common, and the early storefront nickelodeons gradually gave way to sumptuous moving picture theatres. By the time silent films had reached their zenith in the mid 1920s, a new invention involving synchronized sound was introduced, soon followed by other technological advances such as color, wide screen presentations, 3-D films, stereophonic sound, digital surround sound, et al. By today’s standards, Mr. Porter’s 1903 epic may be an historic anachronism, quaint but highly primitive, but it marked the beginning of a great industry. As the motion picture exhibition industry grew there came a need for standardization and professionalization of all aspects of the business. Then, as today, the weakest link in the chain between the making of an epic motion picture and bringing it to the screen for the public is the projectionist. It seems fitting that the man who had the greatest impact on modern motion picture projection would have been the son of a locomotive engineer, and would have begun his own working career as a railroader. A visit to any of today’s Internet search engines for information on F. H. Richardson will, at the most, provide a reference to a used copy of one of his BLUEBOOK OF PROJECTION series. Yet, Richardson was an important pioneer in the technical aspects of moving picture exhibition from its infancy to its zenith when he passed away. This lack of information in this age of information technology is truly lamentable, and the following materials are intended to shed light on this extraordinary man and his life’s work. On the following pages you will find the beginning of a biography of F. H. Richardson, several of his lectures and talks and other material that I have been kindly provided by his heirs. These provide not only a wealth of historical and technical information, but also a keen sense of Richardson’s love and devotion to the art and science of motion picture projection. This is a living document, and far from complete as you now see it. I will add to it as I am able to find further information, both biographical and technical. Your indulgence is appreciated. Frank Herbert Richardson was born in Centerville, Iowa, on October 25, 1866. 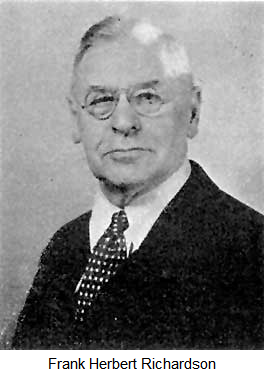 His mother was Emma Wentworth Richardson (a descendent of Lord Wentworth who was mentioned in Cheadle and Milton’s “The North West Passage by Land”). She died shortly after giving birth. His father was John Calvin Richardson, who was born near Londonderry, Vermont, and served in the Civil War. John Richardson participated in sixteen battles and was wounded at Wilderness, Virginia. After the war he established himself as a furniture manufacturer and later as an undertaker in Unionville, Missouri. No large amount of success came his way, so he entered the service of a railroad as a locomotive fireman, later being promoted to engineer. He was killed in a collision on February 1, 1892, when the oncoming train’s engineer fell asleep at the throttle. Following his mother’s death, young Frank lived with his grandparents on a farm near Centerville. When be was about ten years old, Frank’s grandmother died, whereupon Grandfather Richardson sold the farm to Frank’s Uncle Harlan, moved to Centerville and re-married, his new wife eventually bilking him of everything she could lay her hands on and then divorcing him. Frank then moved in with his father and stepmother who were living in LaClede, Missouri. His stepmother made his life miserable whenever his father was away. After many whippings that left his back bloody and scarred, young Frank finally rebelled, took the whip away from her, broke it and ran away. Homeless, with early winter snow on the ground, and penniless, he trudged to the Hannibal & St. Joseph RR tracks to hop a freight train. Finding a car of shelled corn whose door was not sealed, he piled in and almost froze to death by the time he reached the St. Louis freight yards. Cold and hungry, he hung around the front entrance of a hotel and shortly a man offered him 25 cents to do an errand. As he was finishing this errand, another man offered hams 25 cents to do another errand. Thus enriched, he had a decent meal and was ready to face his future. He subsisted selling papers, running errands and doing odd jobs to keep body and soul together. When he was not busy he hung around the hotel where he was eventually singled out by a man who offered him a job on a farm some distance away provided he could arrange his own transportation. He hopped several freight trains and made his way to the farm and the promised job, but the man’s wife made young Frank’s life miserable, and after two months he left, and headed back to his grandfather’s old farm, mostly because it was his only memory of a place where he had found happiness. and both Uncle Harlan and Aunt Amelia were happy with him and treated him very well. Upon completion of this job, Frank was paid in full and decided to visit his father. They met outside his home and had a long talk, Frank making it clear that he would not, then or ever, live again with his stepmother. As an alternative, the elder Richardson offered to put Frank in the Brookfield Academy, a private school in LaClede, and pay his board and room at a boarding house. This arrangement lasted two years during which time Frank got his first taste of real excitement when two blocks of local businesses were consumed by fire. Meanwhile, Frank’s father left the Hannibal & Saint Joseph RR and took a job as the first engineer to be employed by the Oregon Short Line RR, the construction of which was about to commence, starting at Granger, Wyoming. He sent young Frank a pass and some letters to various conductors which enabled him to get to Granger to meet his father. His father almost immediately secured him employment as night watchman of the material train’s locomotive. His job was to take charge of the locomotive at the end of each day’s construction work, fill the tender with coal and water, wipe the engine clean and bank the fire, after which he was able to sleep. The next morning he would spread the fire, clean the ash pan, and get up steam ready for the engineer and fireman to take over. He continued in this position for several months, and, when the regular fireman quit, he was promoted to fireman at a salary of $80/month. He continued in this job for about a year. When a dispute arose over the length of the “run” Frank’s father was to have, his father quit the Oregon Short Line, eventually getting a job as engineer with the Wabash RR in Moberly, Missouri, while Frank remained with the OSL as an engineer until his engine was sent to the shop to be overhauled. Thus, Frank found himself relegated to the “extra board,” and, being too young for regular work shifts, he quit and headed for Moberly where he found a job in the railroad’s paint department. For the most part he painted depots and work sheds, and later was assigned a velocipede (a one-man self-propelled hand car) and sent out on the line to paint switch stands and signal boards. Upon leaving the Wabash, Frank found employment as a brakeman on the Chicago, Burlington and Quincy RR. Then he joined a track laying gang building a new line west from Minneapolis. When that job ended, he found work for a purveyor of coal tar roofing paint, which led to his forming his own roof painting business. When that business got slow, Frank got a job as a brakeman on the Chicago, Minneapolis & St. Paul RR. He held this position until he felt he was strong enough to be a fireman on the Wabash. Returning to Moberly, Frank was met by his father who introduced him to the railroad’s Master Mechanic. Frank was hired as a fireman and worked on the Wabash for about four years. Frank had met Miss Lizzie Francis Johnson while in school in LaClede, and had fallen in love with her. Given the proximity of LaClede and Moberly here he was working, it wasn’t long before Frank renewed his acquaintanceship with Lizzie, and soon proposed to her. She accepted and Frank and Lizzie were married at the bride’s home on December 22, 1887. At this time Frank was 21 years of age. Following the ceremony, Frank and Lizzie took the train to Moberly where Frank’s father met them and took them into his home. Frank remained at the Wabash for five years, when his wife’s brother, who had invented a machine to efficiently mass produce wooden handles for machinery, invited Frank to join him in\ this business. Frank left the Wabash, borrowed $1,000, and move to Linneus, Missouri, where they built a factory. The invention did not prove to be successful and after a year they sold the factory and inventory at a loss. Next Frank found employment on the Colorado & Southern RR as a fireman and soon was able to send Lizzie a pass so she could join him at Fort Worth, Texas. However, when she arrived she found that Frank had been discharged over a fight he had with a conductor. With the help of friends Frank and Lizzie got a pass to Palestine, Texas, headquarters of the International & Great Northern RR. They lived with one of Frank’s relatives, E. J. Beaman, and his wife. Beaman was in the furniture business. It was Frank’s hope to get a job on the I & G N RR, but the railroad was laying people off at that time, so he joined Beaman in a house painting business, a venture that lasted two years. Then Frank found employment at the Palestine water works, being provided a salary of $80/month plus the use of a company house. After several years, ill health as a result of the dampness of the house caused Frank to leave Palestine, and he next worked for a large saw mill in Beaumont, Texas, as an engineer, but the poor condition of the power plant drove Frank to leave this position, and luckily secure a position as engineer at the Palestine Electric Light Company. On his first day on the new job, he found that his predecessor had cruelly sabotaged the equipment by putting emery powder in all the engine and dynamo bearings. Frank called upon his friends at the railroad shop who helped him clean and re-babbitt the bearings, and get the machinery running smoothly. Parenthetically, the engineer who sabotaged the bearings was arrested, tried and imprisoned. In the absence of more of the detailed biography above, which I hope to continue as more material becomes available, Richardson’s granddaughter, Mary Lauria, notes that Richardson subsequently found himself in Chicago where he authored “F. H. Richardson’s Standard Guide to Chicago for Tourists and Travelers” in 1905. He also wrote for the Railroad Man’s Magazine, and for Cavalier. In 1916 he rode he rode to Canada and back, a journey of 2,500 miles, on his twin Harley Davidson motorcycle, with his daughter Nellie. In the 1920s he wrote for the Motion Picture Herald. During his career he traveled all over the U. S. and Canada. He was active with the Society of Motion Picture Engineers from its founding in 1916 until his death in 1943. Some of the following material will provide valuable insights. First of all, gentlemen, I shall take the liberty of laying before you certain matters of a more or less personal nature. In the earliest days of the motion picture industry and for many years thereafter I was compelled to demand attention to projection with every ounce of vigor at my command. Projection was then very little understood, even by the men engaged therein. For the most part it was ignored as of trivial importance by almost everyone else, including those in control of and operating theatres. Projection equipment was then quite simple and crude. The projectionist of that day was regarded as nothing more or less than a man whose duty it was to keep a light of some sort upon the screen, and to keep the various machines running. Very few were able to see any possibilities for projection improvement, or even the necessity for improvement, insofar as concerned the screen image. We were all much younger then. Everything was new. Conditions were decidedly crude. With very few exceptions, standards did not exist at all. It so happened that to myself fell the lot of assembling practical information concerning projection, which I can truthfully say did not exist at all until my advent into the field as a writer in 1907. I have worked perhaps very much harder than any of you have any idea of. I do claim that through the means of my books, the department I conducted for eighteen years in the Moving Picture World, the departments I have conducted for the past three years in the Motion Picture Herald, its successor, and through my work in the Movie Tone Bulletin and other publications, I have been very largely instrumental in placing projection knowledge upon a systematic, standardized basis. First of all I had four years of practical experience as a Motion Picture Projectionist, then known as a “Machine Operator.” This was immediately supplemented by four years experience as inspector of all the finished product which left the Nicholas Power factory, the then largest projector manufacturer in the world. All of this practical knowledge was tremendously increased and developed by the research and hard work necessary to the collecting and arranging and simplifying of the data, secured literally from the four corners of the world, which went into my books. Let me make it clear that it would be utterly ridiculous for me to claim or assert that all of the vast mass of information contained in my books, or all the great mass of knowledge broadcast through my departments in Moving Picture World, Exhibitors Herald World, Motion Picture Herald, American Projectionist, Movie Tone Bulletin and the Bioscope of London, England, in which a very successful department was inaugurated some years since, was derived from my work as a practical projectionist. Since about 1909 I had the close, and in many instances intimate contact with the leading men in projection in this country and in Canada, with literally thousands of others both in our own country and in many other countries of the world. My correspondence has been very large. It has kept me in close contact with all phases of work pertaining to projection. Gentlemen, my work is not merely a way of making a living. It is my hobby and has been my life work. My friends and my pleasures are almost wholly within the Motion Picture Industry. If in the past years I have seemed overemphatic, if I may have at times dwelt too long upon a subject, if I may have given offence at times by calling a spade a spade too emphatically, it was because of the literally enormous difficulty of arousing the industry and the men engaged therein to the importance of projection, and the enormous damage inflicted upon the finished product of the industry by poor projection work. Often I have been compelled to seem to, or in fact to really disagree with projectionists, which disagreements not infrequently led to arguments. My whole purpose in that was, however, to improve our knowledge of projection, and through improvement of knowledge, to make for betterment in the work itself. I have always regarded Motion Picture Projection as in the nature of a profession. I have worked very hard to make a profession of it indeed. Sometimes in my arguments I was right; also sometimes I was wrong, but in the end we always got closer to the real facts by checking and rechecking the knowledge available at the time. I never took my own views as facts nor did I take anyone else’s views as facts without a very careful investigation. Gentlemen, it would have been impossible to advance projection knowledge as it has been advanced without the constant, loyal support of those many splendid, progressive projectionists who have stood by and helped. The list of their names would fill pages. They are scattered all over the English speaking world, and in some instances the non-English speaking countries, such as, for example, Norway. I have not set all this forth, gentlemen, in order to boast, but because I believe a short explanation of the work of past years, and the methods pursued, might perhaps convey a better understanding and a greater degree of friendliness between us. Visual Projection, under the regime of which the motion picture industry was established, and has spent all but a short period of its existence of thirty-four years, was entirely the work of practical men. Careful investigation has shown that practically every suggestion and every demand for better projection and improvement in projection equipment has originated either with one of the departments I have had the honor to head, with a projection manufacturer or with projectionists in charge of the installation or the use and maintenance of motion picture projection equipment. For many years I have insisted that defective and out-of-date projection equipment does a great harm by making the finished product the industry has for sale less beautiful, and therefore less pleasing than it would be were up-to-date equipment in a better state of repair used. Not only do projectors in a bad state of repair cause a very large and totally unnecessary damage to prints, thus not only injuring the show then being projected, but also the shows that will be projected with those prints thereafter, but it greatly increases the fire hazard. All that is bad enough, but there is still a more serious effect set up, because equipment in a poor state of repair not only makes good work impossible, but it also discourages the projectionist from trying to do good work. He feels that if the manager and exhibitor values high grade work so lightly that they permit the equipment to fall into a state of disrepair, merely to prevent expenditure of the relatively few dollars necessary to keep it in perfect condition, then why should he, the projectionist, worry about striving to procure perfection in results with imperfect equipment. And what is the inevitable result of all this? Why, gentlemen, the thing is obvious. It may have a relatively small effect upon the patronage that is more or less transient, but at least nine theatres out of ten depend upon what they consider regular patronage. That is true, even with the great city theatres. And these regular patrons will form the habit of giving the bulk of their patronage to the theatre in which they find the best entertainment. That is even and exactly true, is it not? Granted that such patrons may be attracted to different theatres by some special production, still you will almost always find them to favor some particular theatre in which they have found the entertainment to be almost invariably good. And, gentlemen, is there a man here present who will presume to question the statement that a perfectly projected picture is more pleasing than one imperfectly projected? Is there a man here present who would dispute my statement that projection equipment in a perfect state of repair will not enable the projectionist to give better results than can be gotten from equipment in an imperfect state of repair? Those managers and exhibitors here present will do well to remember that since their seats are for sale two or more times each day, then they have thousands of seats to sell the public each day. They will do well to very carefully consider the fact that the keeping of equipment in perfect repair will cost an average of a really rather insignificant sum each day. It is a cold fact that if perfect equipment as opposed to imperfect equipment will only improve the screen image sufficiently to cause the sale of an average of a half dozen of those empty seats each day, they will have more than played even with the game, and certainly it is hardly conceivable that this would not be done, especially when it is remembered that the inclination of the men working with equipment is to make a real effort to produce perfect results from perfect equipment, whereas, on the other hand, imperfect equipment automatically sets up a feeling of more or less indifference. Those exhibitors and managers present will serve their own best interests well by understanding this fact clearly: from the box office point of view, it is never a paying proposition to permit either your picture projection equipment or your sound equipment to fall into any state of disrepair. If you do you will inevitably lose more than you will gain, and in all human probability very much more too. I feel, gentlemen, that the time has now come when positive action ought to be taken, looking to the wiping out of the disgraceful state of disrepair into which some theatres permit their equipment to fall. It is neither fare nor honest to the motion picture industry. It sets up a dangerous condition. It is bad from any and every possible view point. I feel that all projectionists and all I. A. (International Alliance [of Theatrical and Stage Employees]) unions should lend support to a movement to induce or even to compel all theatres to maintain projection room equipment in at least a safe state of repair. I am indeed glad to be able to say that we now have a goodly percentage of Exhibitors and Theatre Managers who take a very real interest in projection, recognizing the box office value of high grade work, providing good up-to-date equipment and maintaining it in a first class state of repair. Still, while this is true, it is also true that we still have with us exhibitors and managers who apparently have no understanding of the box office value of high grade projection. These men are often almost criminally neglectful of the rights of theatre patrons. They are without any right understanding of what is best for their own financial interests. The rights of theatre patrons are that productions shall be placed before them in the best possible manner, both as to excellence of the screen image and of the sound, and that the fire hazard be reduced to the lowest possible limits. Those, gentlemen, are just as truly rights vesting in theatre patrons as it is in your own right to find good wholesome food in the sealed packages you purchase at the grocers. And now I believe it is my duty to speak with you, and particularly with the managers present, concerning a matter which just at the present time is of high importance, namely whether it is good practice to project motion pictures and to reproduce and project sound with one projectionist. In other words, whether it would be profitable to the management to reduce the projection force to one man. I hold, gentlemen, that such a reduction would, in the end, mean financial loss rather than financial gain and I will now set before you my reasons for saying this, with the understanding that my remarks are not intended to apply to small theatres in which relatively simple sound equipment is used. A certain Pennsylvania exhibitor has evolved a series of cards which he hands out to his patrons. One of these cards reads, “If a motion picture machine requires two men to run it, then a dog should have two tails.” Gentlemen, this is about as childish a statement as could well be imagined. This exhibitor has the exceedingly foolish idea that modern projection involves nothing more than the running of a single machine. He visualizes projection as a merely mechanical operation and apparently has the idea that sound reproduces itself without any attention by the projectionist..
As to the “running a machine” end of it, may I suggest that if mechanics were the only thing involved, there is not merely one machine, but something like half a dozen of them operating simultaneously. First are at least two projectors, both of which must be operated at the same time at intervals, and the idle projector must be threaded and have other attention while the working one is in operation. Then too there is a motor-generator set, which, while it may require little or no attention while in actual operation, must nevertheless have very careful, intelligent attention while idle, if it is to operate economically and not wear out too fast. There is a main amplifier which requires intelligent attention when not working and more or less manipulation when in operation. There is a P. E. (photoelectric cell) cell amplifier and cell which must have constant attention if good results are to be had, and a pick-up optical system which also must have careful attention each day. Then too, if there are records there is the machinery which goes with record reproduction to attend to, and it frequently gives trouble a-plenty. In addition to all this, which this exhibitor visualizes as the mere “running of a machine,” there is an audience in the theatre and a powerful light beam concentrated upon a highly flammable substance, the ignition of which may easily cause panic and death. Yet this exhibitor has the idea that “running a machine” covers it all. His statement that projection is safer since sound came in is in the nature of news to me. I would very much like to have that statement explained. I ask that any Managers or Exhibitors present clearly understand that in this I am not fighting any one’s battles. I am merely trying to lay this one-two man proposition before you as I know it to be, after more than a quarter of a century of experience with projection matters. Of course if an exhibitor cares nothing for the excellence of results through his horns and on his screen; if he is not at all particular as to how rapidly his equipment deteriorates and must be replaced, or how relatively high his repair bills may be, then he may get along very well with one man. If, however, he does care about these items, then he will, in my opinion, do well to stop and think pretty deeply before he attempts to “save” a man’s wages by adopting the one-man idea. If he does adopt it, it is to my mind a moral certainty that in the end he “save” the wages all right, but only at the expense of a very considerable loss in equipment deterioration and at the box office, amounting to far more that the saving in wages. A man who feels that be is being overworked and treated unfairly never delivers the best results. He is more or less dissatisfied, and a dissatisfied man, as you know, is a careless man and carelessness in projection means damage to equipment and to both horn and screen results. That is as inevitable as death, gentlemen. The difficulty lies in the fact that the direct saving in wages may be clearly seen. There is no doubt about it. It is saved! The resultant loss is, however, insidious. It cannot be directly seen. However, common sense and a knowledge of human affairs should convince you that it is there. I might say a great deal more on this subject, but will not. I will close this section of my talk by advising Exhibitors and Managers to have two men in their projection room, but to make an inflexible rule that one be directly beside the projector when it is in operation, and by “beside” I mean in operating position in front of the observation port. I advise that failure to be there be subject to severe penalties culminating finally in discharge after several repetitions of the offence. In two-man projection rooms the unions can have no possible legitimate objection to discharge of a man who leaves the projector when it is in operation, except possibly in case of some unusual emergency. Please understand clearly, gentlemen, that in all this I speak of the usual city theatre in which complicated, costly sound equipment is used. What I have said does not necessarily apply to small theatres, in which cheap, simple sound equipment is used, thought I hold that even in such theatres the projectionist should have a helper to attend to threading, rewinding and trimming the lamps. There are a great many things to consider in projection if we may hope to attain the highest possible results on the screen and through the horns, and therefore the best box office results. One very important item concerns the method of handling the whole theatre staff. In what I have said, or will say, in reference to all these various things, I don’t want any manager who may be present to imagine I am doing anything more than direct his attention to certain highly important matters which it is possible they have not heretofore given the consideration they should. Many men in authority are quick to censure when something goes wrong, or even when something is not well done. They will almost always raise the roof when something happens which possibly is not the fault of the projectionist at all. But when something is put over exceptionally well, such men seldom ever take the trouble to say a word of praise or commendation. Such an attitude has the effect of discouraging men from striving to excel. Men who are treated thus will seldom do more than they feel they have to do in order to get by. They fell that they are never accorded any apparent credit for striving to put things over exceptionally well and that the office does nothing but raise hell when something goes wrong. I would very strongly advise exhibitors and managers to think over what I have said. The projectionist is not merely your hired man. He is the man upon whose knowledge, skill and painstaking care you must depend absolutely for the excellence with which both your picture and your sound program is placed before your audiences. The work will unquestionably benefit, and benefit very largely too, if you give him your cooperation and an occasional word of appreciation for good work, as well as a bawling out when things go wrong. If you take the attitude I have suggested and you have the kind of man you should have in your projection room, it will get you something money cannot buy. And now I would for a few minutes to discuss certain matters with the projectionists here gathered. During the past three years events have moved fast and have brought into your work new and highly important factors. Sound has added to the silent shadow an effect which makes it very close to the living reality. This splendid achievement of the scientist and the engineer must be and is placed in your hands for rendition before the public. Upon your knowledge, your skills and your painstaking care the motion picture industry, the exhibitor and the public must depend for the excellence and the completion of the illusion. If the illusion is not perfect, if you have not brought to your work that large degree of skill, that range of knowledge and the painstaking care necessary to perfection in projection, then the effectiveness of the whole thing will, in the very nature of things, be depreciated and made less valuable as a form of theatrical entertainment. You, gentlemen, who are now projecting sound in synchronism with motion pictures, have every reason to feel proud of your profession. You have had given into your hands a very difficult task. I say “difficult task” because while a poor or mediocre grade of sound reproduction and projection may not require a high amount of knowledge and ability, I can tell you, gentlemen, that to cause sound equipment to function perfectly and produce the splendid results of which it is capable, is a task demanding brains, ability of no small order and some feeling of pride in accomplishment. In motion picture projection the man who forges ahead and really succeeds is the one who has a real interest in his work, plus pride in its high grade accomplishment. I like men who pick flaws in their own work, and, of course, seek to remedy them. Did you ever stop to think that the man who is satisfied with his own work, in the very nature of things, automatically ceases to advance. If a man regards his work with too much admiration, it is but natural that he would see no particular reason for expending energy in the attempt to further improve it. He therefore makes little or no effort to improve, hence is at a complete standstill. And now, gentlemen, before I show you some pictures, I want to say a few words to you in reference to the printed page. The time has come when a projectionist can carry on successfully without the aid of the printed page. There are now positions in the projection field paying as high as $8,000 per year, but you may rest assured these positions are not reached by men who don’t study their business very closely. The Bluebook of Projection is available to you. It has been the recognized standard in projection matters for more than 20 years. The United States of America’s Government itself purchased 600 copies, paying the usual price, save for the usual discount for quantities, passing the copies out to each of its ships and army cantonments which have motion pictures. It is in three volumes, totaling 1,500 pages and 478 illustrations. The projectionist who does not have available such a work as this, costing $10.20, is missing much. We have not hundreds, but literally thousands of letters from satisfied projectionists all over the English-speaking world expressing satisfaction with the work therein. Each week in the Motion Picture Herald, I conduct what is known as the Bluebook School, in which from three to four questions are asked pertaining, at the present time, to reproduction and projection of sound. These questions are all taken from the Bluebook index. The projectionist who does not follow this school most emphatically is not alive to realize his own or his employers best interests. Once each month in the Better Theatre Section of the Motion Picture Herald I give you from eight to ten pages of projection matter. While I am aware that certain small-minded men may criticize the articles, I am nevertheless going to make you a proposition. I have arranged with the Motion Picture Herald to permit me to offer you, for this night only, a two-year subscription for the price of one. This is done wholly and entirely to get you into closer touch with projection matters. At this reduced price the cost amounts to something like three cents a week, and for two years you will receive the Motion Picture Herald, and the Better Theatre Section with eight to ten pages of projection matters each month. Mark you well, gentlemen, this department has stood the test for 22 years. It is no new untried thing. Please understand that I personally will not benefit from your subscribing, one way or the other, so far as money remuneration is concerned. I am doing this wholly and entirely for what I believe to be your benefit, for what I believe to be your own best interests. I shall now present for your entertainment a few pictures illustrative of the fact that in some theatres projection equipment is permitted to fall into an astoundingly disgraceful and highly dangerous state of disrepair. The parts were all taken from a projector mechanisms sent in for repair by exhibitors. Please understand clearly that these parts are not fakes. They were sent in as removed from mechanisms. They offer mute evidence of the amazingly wretched conditions still all too often found in the projection rooms of theatres. They point straight to the need for the application of a sharp curb to the men who permit them, and a legal curb seems to be the only one which can be made effective. There followed a series of lantern slides with the following commentary…we don’t have the slides, but we can imagine what they portrayed (undercut sprockets, worn out intermittent movements, worn and chipped gears, etc.). Now, gentlemen, you may say that parts in such wretched condition would seldom be found, in which conclusion I agree. Especially bad parts were selected for making the slides I have shown you, but the fact remains that in many thousands of theatres, projectors in a bad state of repair can be found. The manager – I do not say this in criticism, but merely as a matter of fact – usually is eager to keep down the overhead. In a great many cases he is over eager. He forgets that if he prevents the expenditure of a dollar by compelling his projectionist to continue using equipment parts which, while they look quite all right to the naked eye, should nevertheless be discarded. The net result will inevitably be to lower the tone of projection work and thus, without any intent of so doing, cause loss at his own box office. Remember this fact, gentlemen, such matters as these cannot possibly be judged by immediate cash drawer results. They must, as a matter of common sense, be considered over a long period of time. It is nothing but plain common sense to conclude that if your screen image is improved and KEPT THAT WAY, in time the result will be felt at the box office. It is nothing but the commonest kind of common sense to conclude that if your projection equipment is permitted to fall into any state of disrepair, and the screen image be made thus less beautiful, that fact will be felt at your box office. Regular patrons will come less often to the theatre, or, if there be another theatre available, they will go there more often. That is just a proposition analogous to the statement that one plus one makes one. I now propose to show you a motion picture which the International Projector Corporation had taken at a cost of nearly $3,000. This picture was taken especially for the purpose of a trip which took my daughter and I over 17,000 miles in the United States and Canada, and on which I talked to more than seventy locals (IATSE local unions). I mention the cost of this picture as illustrative of the fact that the International Projector Corporation sees good reasons why these matters should be brought before you. In this picture you will have views of a few of the great numbers of machines used in the production of projector mechanism parts. In this factory these machines are covering the space on ten floors of a great building at 90 Gold Street, New York City. I shall explain these various mechanisms and operations as the picture runs. I want you to examine it very closely. Notice very particularly how the finished parts are tested for accuracy, either with elaborate instruments which show errors on an illuminated, magnified scale calibrated down to as infinitesimal a measurement as one twentieth thousandth on an inch in some cases and never less than ten thousandths of an inch, or the testing may be done by a micrometer held in the hand, which registers errors in thousandths and even ten thousandths of an inch. There followed the motion picture, probably with ad libbed commentary…. There, gentlemen, I want every projectionist here present to ask himself this question: “Would I be acting fairly, or be ‘playing the game,’ if I failed in any degree to keep projector mechanisms made with such great care properly lubricated (which does not mean over oiled, but lubricated adequately) and in the very best possible adjustment?” Ask yourselves that question and answer it to yourselves with perfect mental honesty. 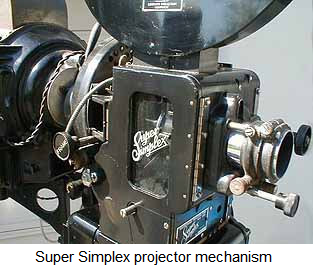 On a personal note, I would guess that the motion picture used with this lecture featured the manufacture of the Super Simplex projector. This projector debuted in 1928, and many survive to this day in older theatres and screening rooms. In fact, some replacement parts are still made by La Vezzi Precision, Inc. Shown below is a Super Simplex projector mechanism fitted with fireproof upper and lower film magazines and a low intensity carbon arc lamp. The mechanism has a rear shutter and, belying it’s relative modernity, is fitted with a shaft for a hand crank for non-electric operation. The motion picture, the moving picture or the “movie,” as it is variously known, was made practical as a form of public amusement upon the invention of flexible celluloid film and the invention of what is known as the intermittent movement coupled with what is known as the “Latham Loops.” The four outstanding names in this connection are George Eastman, who invented the flexible film, C. Francis Jenkins, who invented the first practical motion picture projector, Thomas A. Edison, who perfected Mr. Jenkins’ invention and made it commercially practical, and Major Woodville Latham, who invented the Latham Loops (note 1), the purpose of which I shall describe further along. In the beginning motion pictures consisted only of runs of fire fighting apparatus, dances, waterfalls and like scenes which required no especial preparation or acting. Of “stars” there were none, except such as twinkled in the blue vault of heaven. The motion picture was used as a ‘stunt’ in vaudeville and other theatres, where purely as a novelty and curiosity it had tremendous pulling power. Late in the fall of 1895 or early in the spring of 1896 someone converted a vacant store room somewhere below and near the City Hall in New York City into a “Moving Picture Theatre.” This was the first theatre devoted wholly to a “movie” – a word coined many years later – but unfortunately there is no written or photographic record of this “theatre.” Only a very few of the old, old timers even remember it and they are not certain of its exact location. In 1896 Messrs. William T. Rock and Walter Wainright obtained a concession in a New Orleans, Louisiana, park and showed moving pictures during the two months of summer. When the concession or the park closed they rented a store room on Canal Street in New Orleans and opened what was called the “Vitascope Hall,” showing moving pictures at ten cents admission. This was the first place of public amusement showing motion pictures exclusively of which there is any written or photographic record in existence. Mr. Wainright died many years ago. Mr. Rock became President of the Vitagraph Company, which is the only one of the producing companies of that day which is still in existence. Mr. Rock passed away some years since, but his son is identified with the Vitagraph of today. William Reed, who was projectionist at the Vitagraph, is still living. He projects pictures in Atlantic City. In the early days the admission price was almost universally five cents, only an occasional theatre rising to the dizzy height of ten cents admission. The scenes were short, the acting and photography crude and the “flicker” pretty awful. It was not until about 1912 that admission prices began to rise and not until about 1915 that motion picture programmes were produced which in them selves could draw audiences at from 25 cents to 50 cents admission, with an occasional super production, like “Birth of a Nation,” which could soar ever higher. Today at least half a dozen purely motion picture programmes are on Broadway at from a dollar to two dollars admission, with full houses, while such theatres as the Capitol, with enormous seating capacity, are crowded at a from sixty cents to a maximum of $1.25 admission. Florence Turner, who was with the Vitagraph Company in the early days, was the first moving picture “star.” She was a most charming little woman and was exceedingly popular with movie fans of that day. She is now playing in a cabaret in London. She often played opposite John Bunny, the “fat man” comedian of that day, now long since departed into The Shadows of the Other World. But it was not my intention to speak to you of historic matters tonight so much as to explain to you some of the whys and wherefores of motion pictures, to give you an understanding of what they really are and what it is you really see when you look at the silver sheet. To begin with let me say there is really no such thing in all the world as a moving, or motion picture. What the patron of a motion picture theatre really looks at is snapshot photographs, displayed before his or her gaze at the astounding rate of from 14 to 30 per second, or about 900 to 2,000 per minute. Please understand, however, that the latter figure is unusual and excessive, though it is actually done. The average rate is about 18 to 20 pictures per second, of 1.080 to 1,200 per minute. What actually happens is this: strips of negative film, 1-3/8 inches wide by varying lengths, are placed in a camera in which is an intermittent movement capable of moving the film across a photographic lens in three-quarter-inch steps at the rate of presumably 16 steps per second, but which actually vary widely from that speed. In front of the lens is a rotating shutter which opens and closes the lens – opens while the film is stationary over the lens and closing it while the film is moving. Thus you will see a separate and distinct snapshot photograph is impressed upon the negative film every ¾ inch of its length and at the rate of speed I have told you. This negative is developed and “positive” prints are made from it. These positives are spliced together into 1,000 foot lengths. They are 1-3/8 inches wide, 5-1/2 to 6-1/2 thousandths of an inch thick and along each edge is a row of sprocket holes, four holes to each picture. Note 1 - Major Woodville Latham developed this loop to prevent film from tearing while being projected, or, exposed in a camera. Film travels through the camera and projector in a series of continuous and intermittent motions. Accordingly, a variety of pressures build up on the film as it travels through the mechanism. The loops decrease the pressures on the film and are worked into the length of film before it enters the aperture of the camera or projector and after it exits the aperture of the camera or projector. In essence there is slack in the film prior to entrance and after exit so that the slack is taken up in the loop rather than having pressure placed directly on the length of film. The loops are taken up and let out as the camera/projector stutters respectively forward/backward and through the intermittent stops in front of the lens. The Loews broadcasting station has been kind enough to invite me to tell you something about the mechanics of motion picture projection, which necessarily will include some of the mechanics of the process of taking the pictures. This I am very glad indeed to do because I cannot imagine one motion picture patron in ten has any comprehensive understanding of such things, or realizes, except in a vague sort of way, what a truly astounding thing the motion picture really is. Right in the beginning I shall perhaps surprise you by saying that in the strict sense there is no such thing as a motion picture. What you see on the screen is merely an illusion of motion, as I will explain further along. To start at the beginning, the motion picture film is a strip, or ribbon, of celluloid 1-3/8 inches wide by 6-1/2 thousandth of an inch thick, one one-thousandth of the thickness consisting of the photographic emulsion contained on one side of the film. This film was originally about two feet wide and at that stage in its production was coated with photographic emulsion, negative or positive, according to which purpose the film was to be used for. After coating it was “split” into strips of the width before named. It was then run through a perforator, which machine punched a row of small rectangular holes near either edge of the film, there being exactly four of these holes on each side to each ¾ of an inch of film. The film is then packed in light-tight containers and sent out to the studios. The negative film stock, as it is called, is for use in the motion picture camera. It is placed in a light-tight container, or magazine as they are called, its end threaded through the camera mechanism and into a second light-tight magazine, into which it is automatically wound as fast as exposed. Just ahead of the camera lens is an opening a little less than one inch wide by three quarters of an inch high. This is known as the aperture and that is the size of the picture the camera takes. By means of what is known as an intermittent movement the film is moved down exactly three quarters of an inch and, by means of properly applied braking friction, is stopped dead still over the aperture. Just back of the lens is a rotating shutter with a blade which comes before the lens just at the instant that the film starts to move, keeps the lens covered while the film is in motion and uncovers it again at the instant the film stops. During the period the shutter leaves the lens uncovered, the picture, which really is nothing but a very small snap shot photograph, is taken. The shutter again covers the lens and the operation is repeated at the rate of about sixteen times a second, or a bit less that a thousand times per minute. When the taking is completed the film is developed about the same way as is your ordinary Kodak film, though of course the actual mechanical process is very different because of the length of the film. It is then wound upon huge drying drums, or their equivalent, and when dry the negative film is finished. Positive prints are than made from the negative film by means of a mechanism called a “printer,” which has an intermittent movement corresponding to that of the camera. It holds the negative and positive films in close contact and moves them intermittently, just as the camera did the negative, the light, which is an incandescent lamp of known power, being permitted to reach the film and effect the printing while the film is at rest over the printer aperture. There is much more I could tell you concerning the process of taking and printing, but I think you will be more interested in the process of projection, and our time is limited. As I said in the beginning, what you see on the screen of the motion picture theatre is not really a motion picture at all. To explain this is a bit difficult, but I will try to make it clear to you. The projection room of the theatre is located behind, and usually quite a bit above you. It is necessary to have the projectors not less than fifty feet from the screen, and seventy-five to one hundred is much better than a shorter distance. This is because the lenses necessary to project a picture large enough for a theatre at a distance of less than fifty feet cannot be made perfect enough in their corrections so that they will give results equal to those produced by lenses of longer focal length, such as are used for the projection of motion pictures at the greater distances. The projection room of the theatre is thoroughly and perfectly fireproof. If a fire should occur therein, the audience is not placed in the slightest danger from the fire itself. The most which could possibly happen would be that the auditorium might become rather smoky. The only possible danger to the audience from a projection room fire is panic. In the unlikely event of a projection room fire, if the audience sits still or passes out quietly there is no possibility of injury to anyone, as the fire is contained within the projection room itself by thoroughly fireproof walls. Within the projection room there usually is a large motor-generator set for the purpose of changing the alternating current received from the power lines to direct current, since alternating current is not good for motion picture projection, though it may be used in an emergency with fair results. This machine is nothing more or less than an alternating current motor, which takes current from the power lines and drives a direct current generator supplying current to the arc\ lamp which supplies the light with which the picture is projected. This lamp uses anywhere from fifty to 120 amperes, and has a candle power of from twenty to thirty thousand. This powerful light is enclosed in a metal housing called the lamphouse. Immediately in front of the light source is a condenser composed of two lenses 4-1/2 inches in diameter. These lenses receive the rays from the light source, refract them and concentrate the light into a round spot of tremendous light intensity at the aperture of the projector mechanism, over which passes the film we have already described. the end of the film before closing the magazine door. He pulls out about four feet of film and threads it through the projector mechanism by engaging its sprocket holes with the teeth of certain sprockets which govern its movement through the projector mechanism. He places one of the frames (a single photograph is called a frame) over the projector aperture and closes a metal gate which carries tension shoes which hold the film perfectly flat over the aperture. He then passes the end of the film on down through another fireproof valve into another fireproof metal magazine, and attaches it to the hub of a second metallic reel, upon which it will be automatically wound as fast as it passes through the projector mechanism. And now comes the wonderful part. The projectionist gets the signal to start projection. He closes the switch controlling the motor which drives the projector (there are two and sometimes three projectors ready for use in the projection room, they being run alternately) and the projection starts. When it has reached a certain speed the fire shutter, which up to now has covered the film, automatically raises and projection starts. I told you you did not see a real motion picture. Now I will tell you what you do see. When the fire shutter is raised, the photograph immediately over the projector aperture is projected on the screen, then a pin down in the gizzard of the projector strikes a dingus called a star, and rotates it one quarter of a turn. This star is attached directly to the intermittent sprocket of the projector, therefore it also is rotated one quarter of a turn, which carries its periphery, or rim, around a distance of exactly ¾ of an inch, and since the sprocket holes of the film are engaged with the teeth of this sprocket, it follows that the film is moved down exactly ¾ of an inch, or exactly one frame, and another one of the thousands of snap shot photographs in its length is placed over the projector aperture. Meanwhile just as the pin struck the star and started the film moving, the metal blade of a rotating shutter came in front of the lens and shut off all light from the screen, so that for what may be termed the fraction of an instant the screen you are gazing at is as black as a cat’s fur. What you are really looking at is, therefore, not a real motion picture, but a series of snap shot photographs taken at a rate of about sixteen pictures per second, or nearly a thousand a minute, and projected to the screen as a considerably faster rate – about 1,200 per minute, or 21 per second. Your eye sees every one of these photographs, which as you will understand, differ from each other only by the slight amount of motion which occurs in or about one twentieth of a second. The human eye has a peculiar function known as persistence of vision. If you are gazing at an object and the light be instantly cut off from it, the image of that object will remain on the retina of the eye for the small fraction of a second. Any oculist will or can tell you about this peculiarity of the eye and it is it which makes the illusion of motion possible. When the light is cut off from the screen the eye retains the image of the picture until the next one has appeared, and thus the two are literally blended together and we have the perfect illusion of motion. Once in a while when some one of the actors passes across the screen at high speed you will see a jerky motion. This is because the motion of the actor is too fast and there is too great a difference in the two pictures for the eye to make a perfect blend of the two scenes. The reason you do not see the dark screen is the same. The rotating shutter master blade passes before the lens and cuts off all the light from the screen about twenty times per second. However this is too great an interval to be taken care of by persistence of vision, and if there were but one blade you would see the dark screen in the form of a terrific flicker. The shutter has two, and sometimes three blades, so that the light is really cut off the screen from 40 to 60 times per second and the rapidity is so great that the intervals of darkness become entirely invisible to the eye. Sometimes you may see a slight flicker, which means that the projection speed is too slow to entirely eliminate flicker – in other words the intervals of darkness and light are too far between. Remember that all this action is at high speed, and that in motion picture projection the parts of the projector must function to within one ten thousandth of an inch in mechanical correctness. The projector must start the film from dead still, move it exactly and precisely three quarters of an inch, at the same time shutting off the light from the screen, stop it again absolutely flat over the aperture and absolutely motionless, uncovering and projecting the picture, all in one twentieth of one second. You may thus see that the motion picture projectionist, who works in semi darkness above and behind you, and to whom, because he is out of your range of vision, you give little if any thought, must work with very real knowledge and great accuracy and care if he places before you the production you have paid to see at one hundred percent value. Discolorations in the light, a too fast motion of the figures on the screen or a dim fuzzy focus picture mean poor projection. A brilliant screen, correct as to speed of moving objects on the screen, and a sharp clean-cut picture means enjoyment for you, and for these things you should thank the motion picture projectionist.